On a sunny Sunday, members of the Bruhat Whitefield Residential Community Association stepped out on to the busy State Highway (SH) 35. Instead of watching a movie and spending time with their family, here they were, rolling their sleeves up and monitoring a road work. Road work? Yes. Anyone who travels on the SH 35, that goes from Kadugodi to Hosakote would know the status of the road. The heavy rains during the last week of September unleashed havoc on this already spoilt road. SH 35 is one of the busiest and densely trafficked roads of the city connecting peripheral areas like Hoskote to ITPL, Whitefield and Attibele. Though this road is known as State Highway, its maintenance doesn’t come under the jurisdiction of Karnataka State Highways Improvement Project (KSHIP). Instead the road is shared between two departments – BBMP Major Roads and Infrastructure Development and Public Work Department. The 5-km stretch of the State Highway-35 from Seegehalli to Kattamanallur Gate falls under Public Work Department, while 3-km stretch of the road from Hope Farm Circle to Belathur part of the Kadugodi Ward is under Major Roads and Infrastructure Development Department, BBMP. The community of residents nearby, who always bear the brunt of this bad road, under the banner of Bruhat Whitefield Residential Community Association (BWRCA) decided to take up the issue and get the road repaired. So what does it take to set the ball rolling? “Fixing of footpaths, cleaning canals and removing encroachment along the road is a long-term planning which was promised to be included in the budget, which was eventually included and approved in this year’s budget,” says Ramasamy. These works are expected to start only from January 2014, as it still needs necessary approval from the councillors and tenders are yet to be passed. What did it take to set BBMP in action? BWRCA drafted a memorandum asking BBMP and PWD to fix the bad condition of roads. It also highlighted the absence of footpaths and encroachment around the area. Signatures of 250 residents living along the stretch were taken. Appointments were fixed with the Secretary of PWD, Chikkarayappa, at Vikas Soudha and BBMP Chief Engineer of Major Roads and Infrastructure Development Somashekhar. The memorandum was submitted to the Secretary to Government, Public Works Department and Chief Engineer of Major Roads and Infrastructure Development, BBMP on Sep 21, 2013. Somashekar mentioned that the necessary budget is allocated and will be presented for the council approval and will take upto January to get the work started. For the immediate relief, the Area Engineer responsible should take care, he added. Then the residents contacted AEE Dyanand and Area Engg Channakeshava, who also revealed the fund crunch within BBMP, says Ramasamy. However, assurance was given on starting the work within four days. The road marked in red is being repaired. The blue part is to be repaired by PWD. Ramasamy requested a meeting with Channakeshava, inorder to tell him what is required to be done in the area. The meeting never took place, but one fine morning, on October 6, labourers were found repairing the road. Seetharam immediately brought this to the notice of other members and R K Misra. R K Misra requested volunteers to monitor the work carried out on the road. Manjunath Athrey of Samarpan was the first one to be there to monitor the work, along with Seetharam. Anantharaman, Jeydev, Sampath Ramanujam, Venureddy and members from Keerthi Residency were also there to monitor the progress. 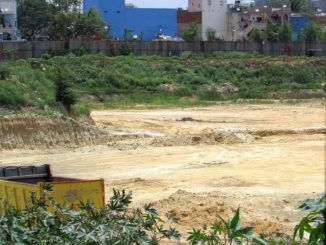 The work started due to sheer pressure of the residents, stated the contractor, whose past payments are still due with the BBMP. He took assurance from the members of BWRCA, to make sure follow-up with the officials will be done so that he can get his payment. The fate of five-km road that falls under PWD is still hanging in balance. Because the properties along the road fall under BDA’s purview. BDA sanctions plan sanctions for these sites and takes betterment charges from them. “They are responsible for footpaths and drains along this road but fail to carry out work on account of ‘no funds’,” says Ramasamy. However, anything related to road – be it a construction work or repair work, it falls under PWD. However, PWD is not responsible for the construction of storm water drains beside the road. this comes under BDA, therefore PWD after construction of road leaves the edges of the road as it is. The residents followed up with Ramesh, Executive Engineer of Bangalore division, who promised to get back after 15 minutes. Promptly after 15 minutes, they got a call from Anand, Assistant Engineer of PWD, responsible for Whitefield area. He assured them that further meetings will be organised with his superiors. Couple of months back, a meeting held at the Panchayat office along with the Assistant engineer of PWD, President of Panchayat and Development officer highlighted two problems that delay the work: Encroachments along the road and the lack of money. “However we believe that the PWD will get into action soon. There is a lot to do. But we have taken the first good step,” says Ramasamy. R K Misra, an urban reforms campaigner and one of the influential leaders in the city, is the biggest support for BWRCA. “I just supported them and got them the necessary appointments. It was the efforts of the community that came together to take this work in hand,” says a modest Misra. Being critical of the city’s governance, he says, “Nobody pays attention to the requirement of the work and its cost.” Budget releases only 25% of the actual cost of the work.” He believes that the bureaucrats, politicians, councillors – all fail to think rationally, while engineers who have the expertise are overloaded with work and have no powers. An introduction to the various civic agencies and parastatals responsible for Bengaluru: BBMP, BDA, BMRDA, BIAAPA, LDA, BESCOM, BWSSB and more. Who does what? 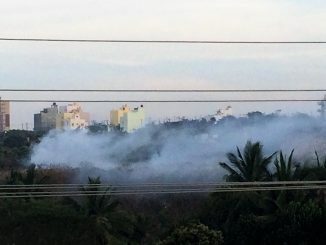 Continuous garbage dumping and fires on BDA land create grave health hazard for residents of Ward 198 in Anjanapura, but who’s listening? Great work done by BWRCA. One of the reasons for the deterioration of this road is the heavy truck traffic that goes through this stretch. I have seen a few occasions when these trucks got stuck in the pot holes created stopping the whole traffic. I thought these heavy truck traffic is not supposed to go through this road at least during the day time hours. What can be done to stop this flow of heavy truck traffic through this way? Lessons for all involved in civic work especially the follow up with concerned after knowing whom to approach.It is not a good sign that it needs ~ 250 calls by a dedicated person to get apathetic citizens moving!. Anyway, good work done by the RWA.Such coverage by citizen matters helps to publicise good work and share info. Could it become a regular feature? Good to see people are waking up to resolve their everyday problems. More such active participation is needed to bring about change.